Uefa president Michel Platini wants football's world governing body Fifa to publish the full report into alleged World Cup bidding corruption. Fifa president Sepp Blatter previously rejected calls to publish the complete findings of American lawyer Michael Garcia, who conducted the inquiry. 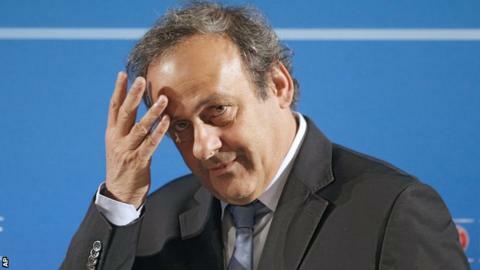 But Platini thinks there needs to be greater transparency. "I have no issue with the findings and recommendations being made available to the public," he said. "As long as the regulations of the Fifa code of ethics regarding the actual investigation are respected, I support the publishing of the report." Allegations of corruption surfaced after the 2018 World Cup was awarded to Russia, while the Gulf state of Qatar was surprisingly selected to host the 2022 tournament. Fifa vice-presidents Jeffrey Webb, Prince Ali bin Al-Hussein of Jordan and Jim Boyce have also called for the key findings of Garcia's report to be made public. Fifa presidential candidate Jerome Champagne also tweeted his agreement: "It is essential to protect the sanctity of the World Cup as a celebration of football and of our universality. It will contribute to the efforts to reconcile Fifa with the football lovers around the globe." Garcia himself added: "Publication would be consistent with statements made by a number of executive committee members." Speaking on Tuesday, Prince Ali bin Al-Hussein, who was not on the executive committee for the 2018 and 2022 bids, said: "The entire football family and those who follow the game worldwide have a full right to know the contents of the report in the spirit of complete openness." The Qatar 2022 bid committee is facing claims of corruption after the Sunday Times alleged in June that former Fifa vice-president Mohamed bin Hammam paid £3m to football officials around the world in return for support for the bid. The Qatari bid committee deny all allegations of wrongdoing.